The branch of chemistry, which deals with the study of reaction rates and their mechanisms, is called chemical kinetics. xThe rate of decrease in concentration of any one of the reactants. Or the rate of increase in concentration of any one of the products. Let us assume a hypothetical reaction in which volume of the system remains constant. Equations (1) and (2) give average rate of reaction (rav). Since Δ[R] is a negative quantity, it is multiplied with -1 to make the rate of the reaction a positive quantity. Units of rate of reaction are concentration time-1. So, if concentration is in mol L-1 and time is in second, then unit for rate of reaction will be mol L-1 s-1. But, in gaseous reactions, when concentration of gases is expressed in terms of their partial pressure, the units of rate will be atm -1. In this reaction, the stoichiometric coefficients of reactants or products are not equal to one. In this case, the rate of disappearance of any of the reactants, or the rate of appearance of any of the products is divided by their respective stoichiometric coefficients. For a given temperature, the rate of a chemical reaction may depend on the concentration of one or more reactants and products. The representation of rate of reaction in terms of concentration of the reactants is known as rate law or rate equation or rate expression. Here, a, b, c and d are stoichiometric coefficients of reactants and products. This equation is known as differential rate equation, where k is called the rate constant. 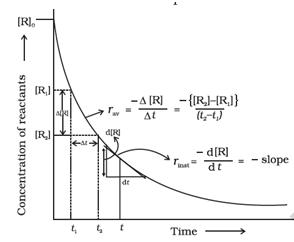 This equation is alsoe called rate law or rate expression. Rate law is the expression in which reaction rate is given in terms of molar concentration of reactants with each term raised to some power. The power may or may not be same as the stoichiometric coefficient of the reacting species in a balanced chemical equation. Rate law for any reaction cannot be predicted by merely looking at the balanced chemical equation, i.e. theoretically. But it must be determined experimentally. The sum of powers of the concentration of the reactants in the rate law expression is called the order of that chemical reaction. Order of the reaction can be 0, 1, 2, 3 and even a fraction. In a zero order reaction, the rate of reaction is independent of the concentration of reactants.